If you’ve ever switched users in Fedora and couldn’t get sound to work (su - testuser or ssh testuser@localhost) this tip is for you! Make sure “Enable network access to local sound devices” is checked. Then click [ Close ] and sound will work perfectly! Hi there, thanks for the tips. One question, what if the remote desktop connection is made from a Windows machine? 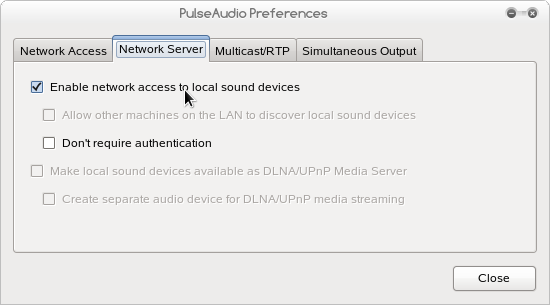 By using this windows user still need to run pulseaudio client at windows side, right? This entry is dealing with a different audio situation: allowing a second account on a single machine to play audio. You’re asking about allowing audio to play from one machine to another. This is possible in Linux, although I’ve never tried it. I would look to RDP to forward audio from Windows to Linux.